Susan Cain’s book ‘Quiet’ Has been described as ‘an extraordinary book that will change for ever the way society views introverts’, and it has certainly made me stop and think about a couple of issues. And my greater understanding is changing the way I act. 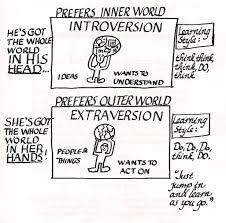 The introversion/extroversion spectrum is not just about whether people love parties and make a noise, sildenafil it is actually about how people relate to the world and the amount of stimulation that they desire. Introverts are very sensitive, they startle more easily, empathise more readily, they are more easily overwhelmed by noise, emotions and others. They are reflective, thoughtful and highly conscientious. The opposite end of the spectrum is the place inhabited by the stimulus hungry extrovert, who craves more noise, adventure, parties and thrives in the midst of the storm. Introverts focus on the meaning they make of events whilst extroverts plunge into them to inhabit the moment. I have long been aware of the limitations of those who inhabit either end of the spectrum: the extrovert under performs in school – too busy enjoying the now to focus on the solitary pursuit of study. 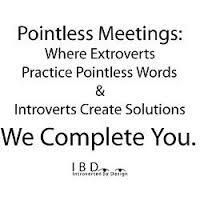 The introvert may fail to form a broad array of relationships with people in the workplace (preferring a few intimate relationships to a wide range of casual acquaintanceships with colleagues), they may be seen as aloof and distant. But what are the key messages of Cain’s book that could and should colour our thinking and behaviour? We know that the average manager is more extrovert that then average person and I have engaged in many discussions about why that might be. Cain suggests that since the 1920s Western culture has come to value the expressive qualities of the extrovert more than the godliness, humility, dutiful values that our Victorian forebears prized above all others. Dale Carnegie et al have indeed taken over the world, promoting people who can communicate, charm and amuse. People who are social able are valued more than those who contemplative. Talkative people are rated as smarter, better looking , more interesting and more desirable as friends. Harvard Business School, which has been so influential in defining what leadership is, requires group work and constant social activities of its students. However, Cain argues that the cult of the charismatic extrovert leader means that our organisations are promoting those who take risks easily, who enjoy variety for its own sake and who may not be attuned to the feelings of those around them. They enjoy the ‘thrill of the chase’ of money and status, making fast decisions, they may add life and energy to a gathering whilst exhibiting all the classic leadership traits but they may not have a rounded view of success and may ignore risks. Introverts, enjoy the opportunity to think the, the world slowly and deliberately, they like to focus on one task at a time- concentration is great. Introverts are not necessarily shy, nor are they incapable of forming strong relationships, who would not love a friend or partner whose strengths are listening and focusing on one individual at a time? People who are introverted do have the talent and skills to be successful , it has certainly not hampered Bill Gates, Warren Buffet, Brenda Barnes or Charles Schwab. Cain suggests that generally we overestimate how outgoing our leaders need to be. The challenge for the introvert is to get through the selection process which may favour the loud and articulate rather than the slower paced, contemplative less charismatic introvert. When a recruiter says ‘I couldn’t see them in charge’ what traits did they think were missing. Cain is very clear that many of the greatest discoveries of our time have come not from the highly collaborative social environments that seek to stimulate creativity but from individuals who have worked alone to develop and perfect the ideas. Steve Wozniak invented the pc in his garage not in an open plan office. Darwin, Einstein, Newton, Curie were all solitary loners; introverts. Cain suggests that the fashionable ‘collaborative’ environments actually inhibit creativity because of the degree of ‘group think’ that comes to dominate such groups, the way teamwork is the zeitgeist of the workplace. There are many who will disagree with Cain’s thesis that it is introverts, working alone, engaging in reflection, and deliberate practice to perfect something, producing numerous iterations of an idea or product, who are the real engine house of innovation. But if you think of the traits of the engineer, the artist, the writer and the poet, these are people who need and thrive in deep concentration and the silence of contemplation. So when we are looking for innovators, perhaps we should give them more space and demand less team work whilst they are in the ideating stage. Given the introverts propensity to be overwhelmed by too much stimulus – noise, activity, emotion, pressure it comes as no surprise that Cain is no fan of open plan offices. Open plan environments have been found to reduce productivity and impair memory. hey are associated with high staff turnover, make people sick, hostile, unmotivated and insecure. There is better communication but also more arguments and fewer close comradeships. So whilst companies save money by treating staff as battery hens, these environments are costing in other ways. And the extrovert fairs better than the introvert for whom such environments are overwhelming and toxic. So for those who are excellent at tasks requiring deep concentration and thoughtfulness the environment of open plan is really unhealthy. The solutions are to allow more working at home, to ensure people can escape either to quiet spaces, ‘no talk days’ or to wear headphones. Even someone as far along the extrovert end of the continuum as I am, used to wear headphones to that I could screen out the activity in the office around me. One of the key themes of the book is that the cult of the extrovert leaders is a western concept and embodies western values. What Cain discovers is that not only are there many Americans who are introverted and don’t enjoy all this noise and sociable activity but that the Asian Americans she talked to found it a total anathema. Culturally Asian communities value very different things from their Western counterparts. So if we recruit for sociable, outgoing, ‘high energy’ leaders we may well be indirectly discriminating against the team work those of Asian cultures where the individual subordinates their own desires to the group’s interests. My own understanding of introversion came form sharing my home with a young man (our au pair) who was a typical introvert, exhausted by a few hours with my son, able to sit alone and practise his guitar, his maths and his English for hours. Someone who seemed not to need friends or a social life but who charmed the Grandmas and would argue the toss with the husband (he had a real stubborn streak). Watching these traits at close quarters was fascinating. But rather than hinder him, these traits have been the key to his success in achieving his career goals. Many years on, he designs motorbikes for Triumph – a boyhood dream. Most people are not completely introverted or complete extroverts, we lie somewhere along that continuum. Introverts are often good at turning on the charm, forcing themselves to appear more gregarious than they feel and disguising their need for ‘quiet’, (but it drains them to do so). Depending on what study you read somewhere between half and third of us are introverts, and to ignore or under value that talent pool and the very particular talents that they have certainly appears to be folly. Cain describes introverts as having ‘soft power’ and suggests that in the way we organise our lives and businesses we need the skills of both extroverts and introverts and that to organise our business to foster that extrovert ideal alone is at our peril.